Dogs are our best friend. Their loyalty is incomparable and we all love them. If you are planning for going on a camping trip, you shouldn’t leave your dog alone at home. But, taking your dog on a camping trip is not a simple decision. There’s a lot of outdoor elements which can harm your dog. You have to prepare for everything to protect your dog from these harmful elements. Camping tent is one of the very first things that you need to consider before going on any camping trip. A dog-friendly tent is very helpful for keeping your dogs in tents. There is a wide range of tents available on market. When it comes to choosing the best tent for camping with dog, there are a number of things you should consider. In this post, we are going to review some of the best tents for dog owners. Before going to the list, let me clear one thing. There are two ways you can keep your dog safe during camping. You can either use a separate tent for your dog or a single tent with dog room. In this post, we will review those tents where you can keep your dogs with you. When it comes to choosing the best tent for family and dog, there is no better option of Coleman. Coolman is a renowned manufacturer of various outdoor gears. There are so many camping tents on their store. The Coleman Sundome 4-Person Tent is specially designed for easy and quick setup so that you can spend more time enjoying your trip. It is designed to ensure ample ventilation. There are 2 large doors and windows to make sure proper air flow inside the tent. The ground vent helps to push the warm air up so that you can stay comfortable inside the tent. It is great for camping in the warm weather. Coleman uses the WeatherTec technology with patented welded floors to make sure you stay dry inside the tent. This waterproof camping tent comes with a rainfly with integrated door awning. The awning keeps the rain out of the tent. The floor is also waterproof. An E-port is attached to help you bring electrical power into the tent. Overall, it is a great tent for the money. It provides a large interior and comes with built-in storage pockets. Coleman uses Polyguard 2X double-thick fabric which makes the tent durable and uses season after season. If you are a dog lover and looking for the best pet-friendly tents, this is the perfect option for you. This is a small size 2-person camping tent by ALPS Mountaineering. It is suitable for the people who wanted to keep their dogs in tent during camping. There are two doors and large mesh side panel for proper ventilation and brightness inside the tent. The doors are helpful for easy access into the tent and the windows ensure maximum airflow. All the tents of Meramac series come with a free-standing design with shock-corded fiberglass poles. It helps set up the tent easily and very quickly. The polyester fly material is water resistant. The tent is waterproof and UV damage resistant. It includes awning over each door which keeps the rainwater outside the tent and creates shade during summer. Therefore, it includes all the necessary things like – storage pockets, stakes, gear loft etc. Overall, this is very reasonable in price. It is a great tent for camping with dog. Since it is a small size tent, you can’t take it for your family camping trip. But there’s enough space to stay two people along with a dog inside the tent. 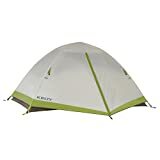 This is a great backpacking dog tent by Kelty. It comes with compact folding 2 pole design for easy and quick setup. It has 360 degrees of mesh panels which provide ultimate breathability and great outside view. This is a 4 person tent. But there are options of one and two person tent to choose for. The 4 person tent is ideal for camping with family and dog. 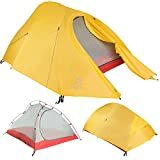 It is a 3 season backpacking tent. There is a large D size entry door, 2 poles and capacity of 4 people to stay comfortable inside it. The wall and floor are constructed with 68D Polyester. Overall, it is lightweight but durable tent for camping with dog. It features seam taped construction, easy and quick setup, fabric walls, free-standing and comes with a portable carry bag. This is the best tent for 2 adults and 2 dogs. It can also be a great option for a couple and dog. 360-degree mesh panels to ensure proper breathability. This is another dog-friendly tent by ALPS Mountaineering. It is also a free-standing dome style camping tent. There are no difficulties in setting up the tent. The two-pole aluminum design helps you to set up the tent instantly. The polyester material construction is water and UV damage resistant. In addition to this, there are two vestibules included in the tent for extra storage space. There are two doors for entering and leaving the tent easily. 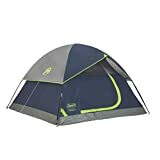 Overall this is a good quality tent for camping with your dog. It includes storage pockets, stakes, gear loft, and some other elements. The company is offering a lifetime limited warranty. If you are looking for a great quality backpacking dog tent, this can be a good option for you. This is mainly a 2 person camping tent. This is ultra-light, durable and freestanding backpacking tent. It is suitable for 3 season camping trips. 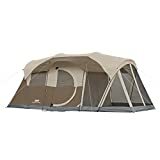 Another great thing about this tent is it includes PU 5000 footprint and ceiling loft pocket which typically cost extra money. It is also a waterproof tent and there’s a rainfly on the doors to keep the rainwater away. This tent also comes with two vestibules for gear storage. For storing important things, it includes a storage pocket. There’s a very small storage bag included in the tent. This will help you in carrying this tent easily. This is really one of the best tent for camping with dog. It comes with a very reasonable price. The company is offering a lifetime warranty for this tent. The Coleman WeatherMaster 6-person tent is a large size family camping tent. If you need a heavy duty tent with dog room, this one is perfect for you. It is spacious enough to fit 2 queen-size airbeds. It features a screen room which ensures bug-free lounging. Coleman uses WeatherTec technology which includes tub floor and protected seams. There’s included rainfly for extra weather protection. The hinged doors are useful for easy entry and exit to the tent. 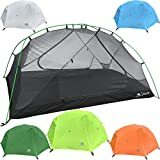 Since it is a large tent, you need to spend more time setting it up. Basically, it takes 20 minutes to set up the tent perfectly. There’s an E-port system which helps you to bring electrical power inside the tent. Storage pockets are also useful for keeping small items safe. Coleman products are always good in quality and price. This is one of the best tent for family and dog camping. If you need larger than the 6 person tent you can pick the 10 person tent also. This is a 6 person large free-standing tail tent by Slumberjack. It comes with full rain fly coverage and two vestibules for added gear storage. The tent is made of 75D heavy-duty Polyester 1200mm with taped seams. There are mesh wall panels to ensure proper ventilation. The poles are made of sturdy fiberglass. Color-coded clip construction makes the tent easy to set up. It is an ideal tent for fishing, backpacking or any other outdoor trip. This is a dog friendly tent so you can keep your dog inside it. The tent provides maximum interior space for a large family to stay comfortable inside it. Overall, it is a very good option for a large family camping with dog. There are 4 different sizes available to choose from. The Eureka Copper Canyon 4 is a 6-pole cabin style tent. It provides plenty of space for four people. If you are looking for the best tent for 2 adults and 2 dogs, this is a perfect match for you. It features a full mesh roof which allows proper air circulation and reduce condensation. The large D-style door helps to enter and exit of the tent. There are 4 large windows on each side of the tent which ensures proper visibility and ventilation. It is a free-standing tent. So, it will take a very few time to set up. Factory sealed seams and floor ensures that you will stay dry and comfortable in any weather condition. Overall, this is a good medium size camping tent. 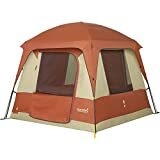 If you are looking for cabin style tent, you should consider picking this Eureka Copper Canyon 4. As the name shows, this is an ultra-light camping tent. It features two-way inner and outer zippers. There are mesh pockets for extra storage. It is a waterproof tent. It includes footprint. The poles and fly help to set up the tent quickly. If you are looking for a weight saving camping tent for your upcoming trip, this is the perfect option for you. It is constructed with durable 20D ripstop silnylon materials. The poles are made of aluminum. Finally, the company is offering a lifetime warranty which is really great. This is definitely the best tent for couple and dog. If you are looking for a tent with dog room, this two-room tent is a good option for you. It comes with a free standing design. So, it is very easy to set up within a few minutes. The poles are made of heavy-duty fiberglass materials. It features tall center which is useful for tall people to move comfortably inside the tent. The wall divider makes two room with maximum space. There are 2 large doors and six windows for maximum air flow. The doors are also useful for easy entry and exit. There are large awning over each door to protect rain from getting inside it and creates shadow during summer. The factory-sealed fly and floor seams ensure great weather protection. Overall, this is another best tent for couple and dog. It features all the necessary elements like – storage pockets, guy ropes, steel stakes etc. to keep you safe and comfortable during camping. Quality comes first when comparing the best tents for dog owners. Though we mentioned all the good quality tent in our list, we recommend you to check the materials used in the tent. At first, make sure that the tent you are choosing provides excellent ventilation. Proper airflow is very necessary for both you and your dog. Luckily, most of the tent comes with several doors and windows which ensures proper airflow inside the tent. Some tent may come with less ventilation system. So, you should consider avoiding these types of tents. If you don’t want to sleep with your dog, you can choose a tent with dog room. It gives you more comfortable sleeping inside the tent. You can also consider having a dog sleeping bag. Nobody wants to waste more time on setting up your tent. Choosing an instant setup tent will save you a lot of time and difficulties during camping. The freestanding tents are more flexible, easy and quick to set up in a few minutes. A large tent may take some time on setup. So, if you don’t need a large size tent, try to pick a small or medium size tent. And it is good to pick a freestanding tent. A waterproof tent is necessary if you plan for a camping on rain. There are so many waterproof camping tents available on market. Check our list of best tents for heavy rain. Camping needs a lot of items to carry. So, I must recommend choosing a portable and lightweight tent. Most tent comes with a carry bag. Try to pick a small, portable, lightweight but durable tent for any camping trip. When you are looking for the best tent for camping with dog there’s a lot of options available on market. The first thing you need to consider before choosing a dog friendly tent is how comfortable it is for you and your dog. Tents come with varieties of shapes and sizes. So, you will have a lot of options when shopping for a tent. We already reviewed some of the best tents for dog owners who want to take their dog on camping. For more information about each tent, feel free to check features and customer reviews manually before buying it. We hope that you will be able to find the best tent for camping with your dog from the above list. 10scope.com is a participant in the Amazon Services LLC Associates Program, an affiliate advertising program designed to provide a means for sites to earn fees by linking to Amazon.com, Amazon.co.uk, Amazon.de, Amazon.ca, and other Amazon affiliated sites. Copyright © 2019 · 10SCOPE · Powered by WordPress.